Outdoor kitchens are a popular addition to any backyard construction project. Homeowners increasingly want a complete backyard environment to entertain family and friends, in which cooking typically plays a large part. Our outdoor kitchens include the basics such as custom grill and mini-fridge frames, as well as customized features like lighting and multicolored tile designs. We offer you a wide range of design and appliance choices. We take great pride in our ability to see each and every one of our customer's needs and wants along with creating a kitchen design to be unique and blend beautifully with the backyard landscape. We build our outdoor kitchens with high-quality products, with long lasting functionality and beautiful style. Have you been searching the world wide web looking for Outdoor Kitchen Builders? STOP! 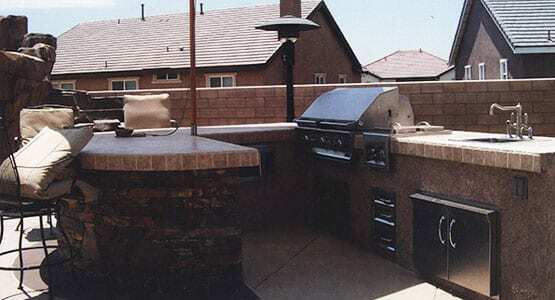 Let us design your outdoor kitchen for both functionality and style. Contact us at(909) 367-6122 or send us a message.